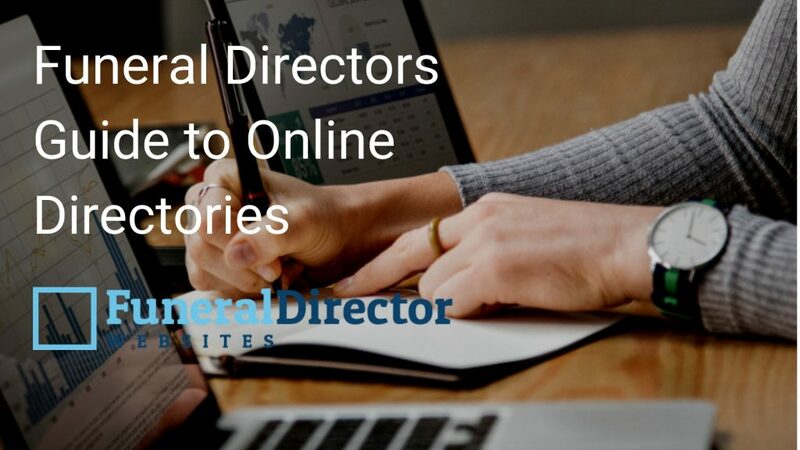 In this Funeral Directors Guide to Online Directories article we take a look into the wider online footprint of your business beyond your own company website and explain why you should take advantage of the free opportunities that exist to be listed on a funeral directors directory. Major initiatives by SAIF Charter with their Local Funeral directory and NAFD with their Funeral Directory have resulted in two new important online directories being published. The directories are sophisticated tools and being listed offers valuable marketing opportunities to funeral directors at no additional cost. It makes sense to have the best possible profile on your listing including the opportunity of a link to your own website from the NAFD site. Why Have Links from a Funeral Directors Directory Website? Google measures links from one web page to another with a crawler that follows links on the web and records that in it's database. The number of links pointing to a page is a factor in determining how important that page is and where Google will rank it. The NAFD and SAIF directories represent an increased opportunity for your business to be found in online searches by people looking for a funeral director. The websites have been created in response to a changing market place as a means of protecting and promoting your business. Whilst there are no guarantees that you will attract customers it is quite possible that you will and they are therefore a positive addition to membership benefits. Apart from the possibility of directly attracting additional enquiries the trade directories also provide a significant SEO (Search Engine Optimisation) benefit. It makes sense to have as many incoming links as possible. Some links are more important than others, incoming links from major trade organisations are relevant and valuable. In the case of the Local Funeral website links are not included at the moment (this could change) however an opportunity exists to be found in a search on the website, possibly increase visitors to your website by an indirect search and potentially gain enquiries. If you were to employ an expensive SEO agency, one of the tasks they would carry out would be to gain relevant incoming links to your website, it makes sense to spend some time making sure your details are added to and are accurate on relevant external websites. On-page factors such as the structure of your website i.e. the amount and quality of text. Off-page factors such as incoming links to your website. The more websites linking to your website and the better the quality, the higher your ranking in Google will be. Your strategy surrounding your website and online marketing should always be to make sure your website is of the highest standard. Tricks don’t work, Google has seen them all and is likely to factor out websites employing spammy techniques when it ranks pages. Google’s goal is to help people to easily find quality content matching what they are looking for. Organic search results - determined by the quality of your page and incoming links. Google My Business listings (GMB - Google's local directory) . Your GMB listing represents a valuable and high profile marketing opportunity that you can take advantage of at no cost. Ads that people have paid Google for. Our first suggestions would be to obtain and optimise your Google My Business listing and also to claim and set up your Facebook business page. Following this the next priority would be trade organisations directories, the funeral profession is fortunate to benefit from the presence of such assets. We’ve listed below our main recommended online directories as well as some that you may not have heard of. We would also be interested to hear of your suggestions and any directories, local or national that you would recommend. If you need help with any aspect of marketing your funeral business please contact us.